This collection consists of eleven folders of letters, envelopes, and place cards from members of the Wilson family to one another including letters from Woodrow Wilson to Ellen Wilson, Margaret Wilson to Eleanor Wilson McAdoo, Sri Aurobindo to Eleanor Wilson McAdoo. Included are the letters and the envelopes used for the letters describing various points of their lives and travels and the letter from Sri Aurobindo to Eleanor Wilson discussing the death of Margaret Wilson in 1944. There are also two place cards with one belonging to Mrs. Wilson and a Mr. Grubbs. 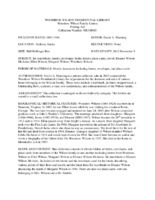 Collector's donation of letters between members of the Wilson Family.